Although Cys is usually the first limiting amino acid for wool production, supplementing Merino sheep with Cys is only 0.8 for wool growth as efficient as supplementation with Met (Reis, 1986; Reis et ai, 1990). Experiments using in vitro culture of fibre follicles from Cashmere goats show that providing Cys without Met resulted in a significant reduction in follicle growth and viability, and Met without Cys supported growth of follicles to about 0.75 of that recorded with both Met and Cys present (Souri et al., 1996). The results demonstrate that Met plays a major role in addition to the provision of Cys, probably in the initiation of protein synthesis and in cell division. The major role of Cys for wool growth is in the provision of substrate for wool protein synthesis as evidenced by the increases in expression of mRNA encoding a family of Cys-rich proteins (Fratini et al., 1994) and the synthesis of Cys-rich proteins (Harris et al., 1994). 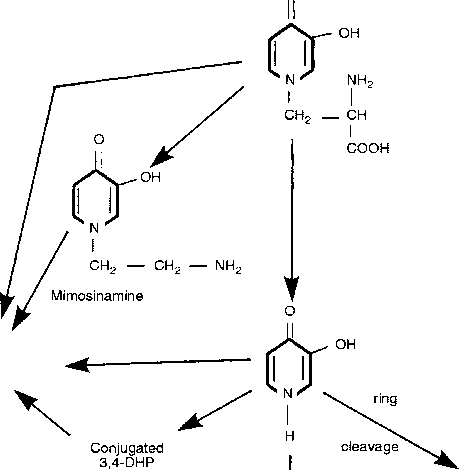 Cys supplementation may also result in a Met-sparing effect as indicated by enhanced activity of betaine-homocysteine methyltrans-ferase (catalysing homocysteine back to Met), reduced activity of cystathionine synthase in the liver of rats (Finkelstein et al., 1986), and reduced transsulphuration rate in cultured hair follicles (Souri et al., 1998b) or in adult humans (Fukagawa et al., 1996).